I’ve had some serious computer issues over the last few weeks, so please pardon any delay. Also, I’ve been busy selling and organizing some of my 45 collection. 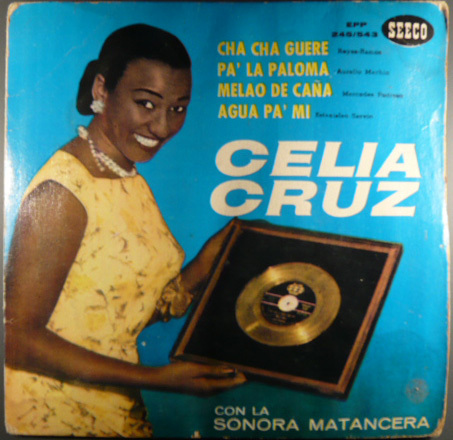 Which is probably the reason why you are listening to this totally awesome 45 ep from Celia Cruz. I purchased this in Mexico City for $.25 five years back and I recently found it stuck in some random LP. Therefore, I felt a need to post this up before it is again lost in the sea of records which I own. Cruz is probably the best know female singer in the history of Cuban music. I am not really going to get into to much detail about who Celia Cruz is, nor La Sonora Matancera (a whole other story). “The Queen of Salsa’s” lifes work speaks for itself. She is pretty much renowned all over the world. Anyhow, I’m being lazy and I don’t want to sound any more redundant than I usually do. Although I love these songs, to be quite honest with you I am not a super huge fan of Celia. 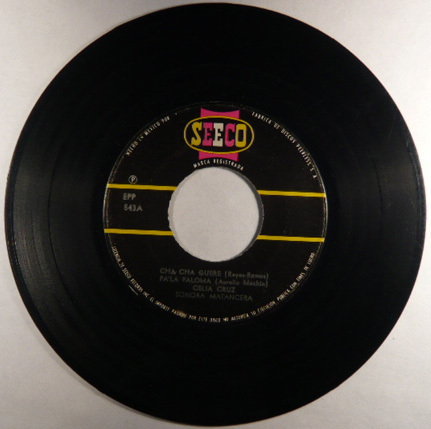 Her early work, the stuff she did with Tito Puente, and The Fania All Stars I tend to like more, but that’s about it. In fact, I find myself liking her contemporary La Lupe much more. Very talented nonetheless, I have a feeling that much of her popularity later in her career came from the fact that she strongly identified herself with the anti-Castro/Cuban boycott movement. Remember her super huge funerals in Miami and New York? Anyway, I’m not getting politically involved. I’m keeping my mouth shut. Let her music speak instead. ps: I am now uploading 320 mp3’s for your listening pleasure.